Organics like food scraps and yard debris make up the single largest segment (28%) of Vermont’s residential waste stream, according to a 2013 study. With only one active landfill serving the entire state, Vermont’s need to reduce the amount of its disposed organic waste is quite evident. As such, it has aggressively embarked on a first-of-its-kind, statewide parallel collection program of all mandated recyclable materials, including yard debris and food residuals. By taking a phased-in, but all-encompassing approach, the state aims to have all Vermont citizens diverting food scraps and other organics from landfill disposal by 2020, with all haulers and solid waste management facilities providing services for these materials. Act 148, the bill that created Vermont’s Universal Recycling (UR) law, was passed by Vermont’s General Assembly on May 16, 2012, to update Vermont’s Waste Management Statutes. Although the UR law went into effect July 1, 2012, the food diversion component of the UR law (as outlined in 10 V.S.A § 6605k) was scheduled to take effect July 1, 2014. While Vermont’s Agency of Natural Resources (ANR) is responsible for overseeing statewide implementation of the UR law, municipalities are responsible for the management and regulation of the storage, collection, processing, and disposal of solid wastes within their jurisdiction. More information, including guidance materials, studies, and reports can be found on ANR’s Solid Waste website. All FSGs are required to source-separate food residuals from other solid waste, and either: (1) arrange for the transfer of food residuals to a location that manages food residuals following the prescribed food residual management hierarchy, or (2) manage food residuals on-site. Generators are affected by the ban if they are located within 20 miles of a certified organics recycling facility, but only if the facility has available capacity and is willing to accept such source-separated organic material. According to ANR, the intent of this distance-to-services radius is to encourage the development and expansion of infrastructure and to allow time for haulers to modify their vehicles so that they might collect the material stream with the same convenience as they do trash. The landfill disposal ban language in place for toxic and difficult to manage materials extends to mandated recyclables, leaf and yard debris, and food scraps under the UR law. As the landfill ban language indicates, there is no de minimis amount of landfill banned material permitted. The UR law indicates that no person shall knowingly dispose of the banned items in solid waste or landfills. Trash Service ProvidersFacilities and haulers could be required to provide their residential fee structures to ANR to encourage transparency. According to ANR the requirements to offer collection of recyclables and organic residuals by haulers and facilities encourages residents to divert their materials with the clause that recycling must be offered with no separate line item charge. This has the effect of the hauler providing residential trash and recycling as a bundled service. ANR’s parallel collection factsheet provides additional guidance. Provide public collection containers for mandated recyclables in equal number, size and in close proximity to solid waste collection containers wherever they are provided, except in bathrooms. “Mandated recyclables” any of the following source separated materials: aluminum and steel cans; aluminum foil and aluminum pie plates; glass bottles and jars from foods and beverages; polyethylene terephthalate (PET) plastic bottles or jugs; high density polyethylene (HDPE) plastic bottles and jugs; corrugated cardboard; white and colored paper; newspaper; magazine; catalogues; paper mail and envelopes; boxboard; and paper bags. “Leaf and yard residual” means source separated, compostable untreated vegetative matter, including grass clipping, leaves, kraft paper bags, and brush, which is free from noncompostable materials. It does not include such materials as pre- and post consumer food residuals, food processing residuals, or soiled paper. “Food residual” means source separated and uncontaminated material that is derived from processing or discarding of food and that is recyclable, in a manner consistent with section 6605k of this title (see the Food Residual Management Hierarchy). Food residual may include preconsumer and postconsumer food scraps. “Food residual” does not mean meat and meat-related products when the food residuals are composted by a resident on site. “Wood waste” means trees, untreated wood, and other natural woody debris, including tree stumps, brush and limbs, root mats, and logs. Increases in system costs are expected to fall mainly on the users of the system, paid through the increase of an estimated $7 to $9 per month per household in fees for services. Haulers will also need to invest in new equipment as they improve their capacity to provide new services. Total capital investments are estimated at $42 – $45 million over the nine-year implementation period, or an average about $5 million per year. Parallel Collection – The UR law requires statewide parallel collection of recyclables, refuse, leaf and yard residuals and food residuals at curbside and at all solid waste collection facilities. Variable Rate Pricing – This refers to a fee structure that reflects disposal services that are charged on a per weight or per volume unit with price setting to incentivize recycling and composting. Also known as “Unit Based Pricing” or “Pay-as-You-Throw,” this structure has been in place in municipalities throughout the United States for decades. The intention of a PAYT structure is to encourage households and businesses to recycle instead of disposing of recyclables by making trash disposal more expensive, with the cost of recycling embedded in the cost of trash collection. Guidance materials for implementing Variable Rate Pricing can be found on ANR’s website. Is launching a Materials Management Map to connect generators of waste to facilities and organizations that are able to accept and utilize the beneficial value of recyclables, quality food for human consumption, and food scraps for animal feed, or composting. Release expected summer 2014. These initial resources are beneficial to ANR, municipal solid waste management entities, facilities, haulers, composters, food rescue organizations, residents and the commercial sectors in meeting the phase-in mandates and bans in the Universal Recycling law. ANR recommends checking the website frequently for updates and additional resources. 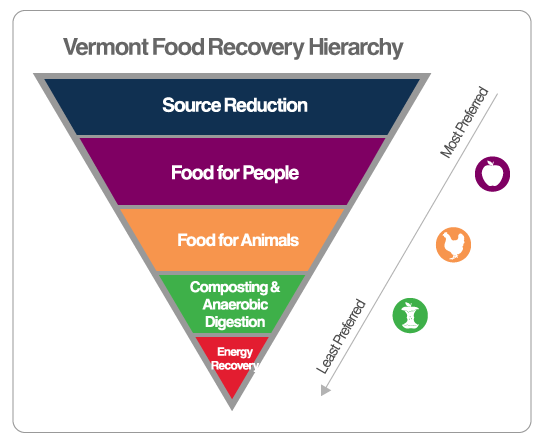 Due to the gradual applicability of organic waste diversion to food scrap generators, as of 2016 it is still too early to see the full impact of Vermont’s food recovery policies. Nonetheless, in a March 2016 conversation with Vermont’s Dept. of Environmental Conservation, analysts reported that all towns have adopted ordinances requiring haulers and facilities to use “pay as you throw” pricing structures. This has resulted in some towns’ trash volumes being reduced by half (e.g. Vernon, Newark, Canaan), and some recycling rates increasing by almost 50% (e.g. Vernon). Notably, the largest solid waste district (by populace) in the state, Chittenden, has reported a 10 to 15% increase in food waste each year since Vermont’s UR passed in 2012.